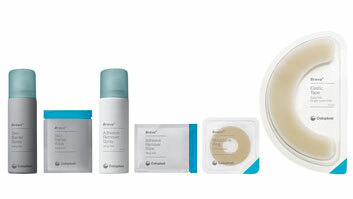 The new Brava® range of accessories features products that are designed to reduce leakage and protect the skin. They also help to achieve customized solutions for different body shapes and needs. The Brava®Protective Seal is a new moldable, extended wear protective seal designed to create a secure fit between the stoma and ostomy barrier. It is durable and resistant to break down, even when it comes in contact with caustic output. The seal helps to maintain healthy skin by absorbing moisture from the skin surface, while maintaining its’ shape, adhesion to the skin, and secure seal around the stoma. It is easy to mold, so it can be applied over skin with dips, creases and folds, stays where you put it, and removes cleanly and easily away from the skin. The Brava Protective Seal comes in three different sizes and two different thicknesses to offer a custom moldable, extended wear solution. A mouldable ring is used to create a tight seal between the stoma and the appliance, thereby protecting the skin against stoma output. The Brava Mouldable Ring features a strengthened formulation that delivers longer-lasting protection against leakage, because it is designed to be the most durable ring enabling it to maintain a tighter fit. It is easy to use can be moulded to fit your body shape. Tape is used to hold the base plate in place for extra security and longer wear time. The Brava Elastic Tape is designed to keep your base plate securely in place while still allowing you freedom of movement. It achieves this thanks to its elasticity. So even if you’re stretching for something on the top shelf or bending down to tie your shoe, you can rest assured that the tape will move with your body and keep your appliance firmly in place. This can mean greater security and longer wearing time of your appliance. A belt is used to give extra support to the base plate to keep the appliance in place. A belt can be very useful if your abdomen is uneven or rounded. The Brava Belt is made of soft and comfortable material, and is discrete to wear. It is skin friendly, easy to apply and the belt comes in both a standard and XL size, which are adjustable so you can fit it for your body. even surface allows the base plate to stick securely to the skin. The Brava Strip Pastecan absorb moisture and improve the peristomal skin area. Tear off the length of strip you need and mould it into shape. The paste must be applied on clean, dry skin. Adhesive remover spray is used to make the removal of your appliance easier. The Brava Adhesive Remover Spray is gentle and the can is able to be completely emptied. It doesn’t sting and dries within seconds so it does not affect further adhesion, leaving you ready to apply a new base plate Adhesive remover wipes are used to gently remove adhesive residues on the skin. The Brava Adhesive Remover can remove residue on the skin and dries within seconds. The wipe is practical when travelling because of its size. Skin barrier spray provides a protective layer of film on the skin to protect it from output. The Brava Skin Barrier Spray is sting-free and can reduce skin problems associated with body waste and adhesives. It dries within seconds and does not build up residues on the skin, leaving you ready to apply a new adhesive. Skin barrier wipe provides a protective barrier of film on the skin to protect it from output. The Brava Skin Barrier Wipe is sting-free and can reduce skin problems associated with body waste and adhesives. It dries within seconds and does not build up residues on the skin, leaving you ready to apply a new adhesive. The wipe is practical when travelling because of its size. Powder is used to absorb moisture from the skin to allow the bag to adhere properly, especially if your skin is very moist. The Brava Powder keeps the skin dry and reduces skin irritation. Protective sheets are used to protect irritated skin from output. The Brava Protective Sheets provide protection of the peristomal skin, and a ready surface for applying a new appliance.